Items 190- out of displayed. Before we begin with the charts let me wish you a Happy and Successful 2015! 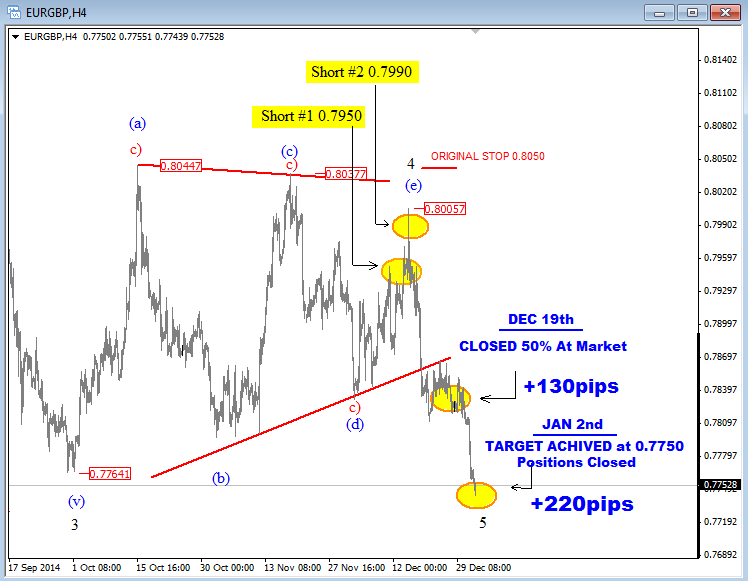 Well, I definitely begin the year very good, if we consider that my target on EURGBP at 0.7750 has been hit today. AS you know I have been in this trade for two weeks if not more, but patience with »trade your plan« approach has paid off. 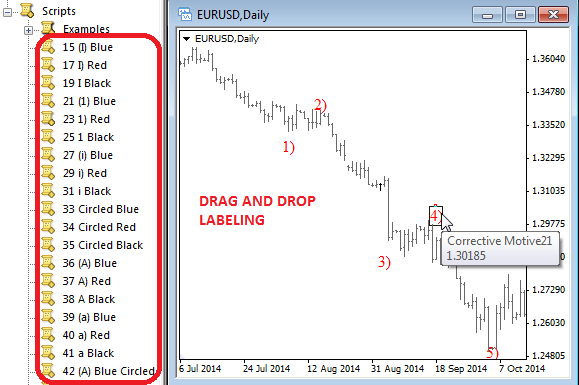 EURGBP trade was also shared FREE on Forexnews. Today is Friday, markets are open normally but a lot of traders still took a day off, so we may not get a lot of interesting price action. Normal volumes should be back next week! As you know US stocks sold-off on the last trading day in 2014. Moves came on profit taking for year end, so actually this move did not surprise me. Also, markets will always try to reverse the moves around the holidays, but then will go back to normal swings once holidays are behind. 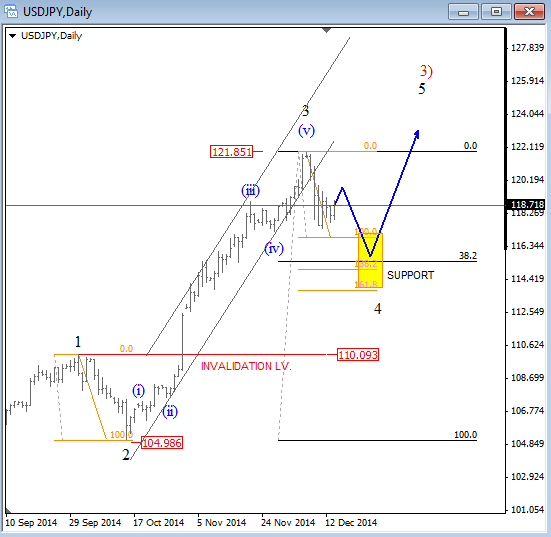 With that in mind, stocks may not be in retracement for long. 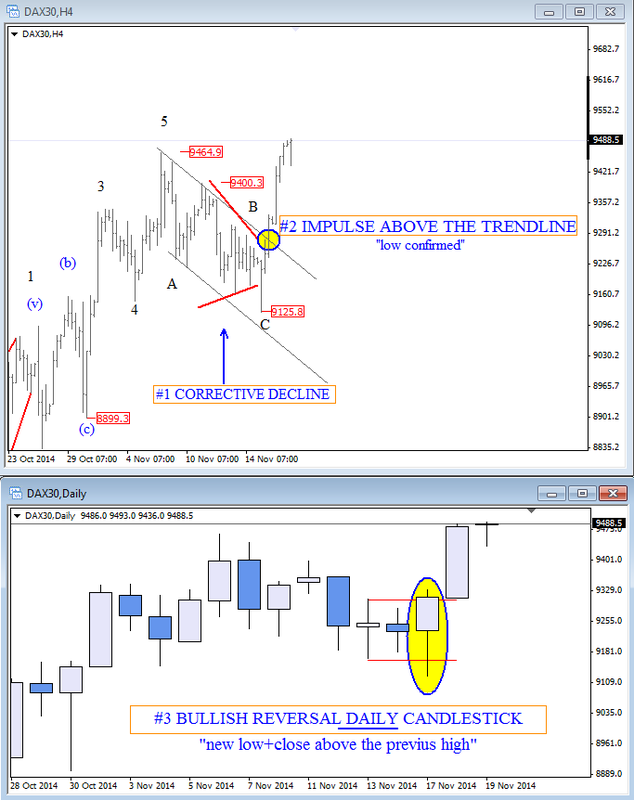 On German DAX, we see a nice deep pullback that is considered as a corrective move. We see price now moving into 9500-9700 Fibonacci zone where support could be found. As such, be aware of a turn up in sessions ahead, but ideally early next week. As you know EUR and DAX are most of the time in negative correlation, so don’t be surprised by bearish EUR forecast while we are looking up on stocks. I mentioned above that more gains could follow on DAX so looking for even lower EUR makes sense. 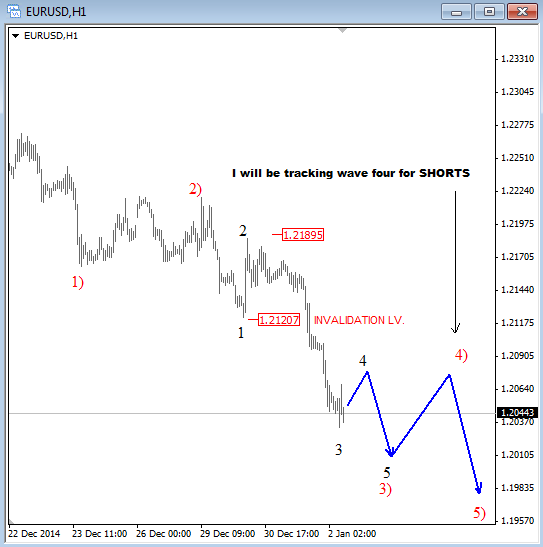 In fact, on EURUSD we see potential wave 3) now in progress that should then be made by five subwaves. 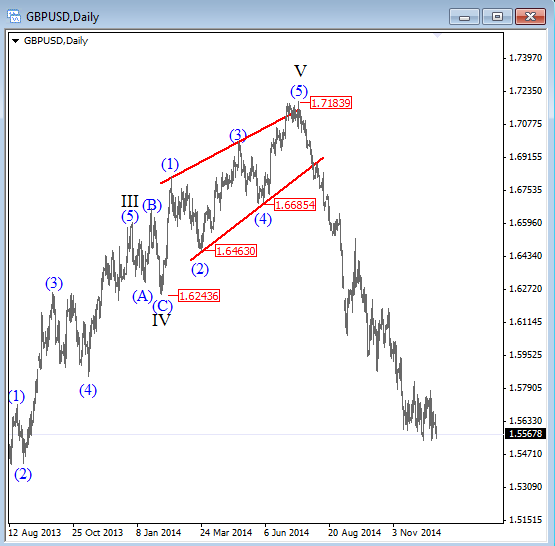 If that is the case then more weakness should follow, even beneath 1.2000. 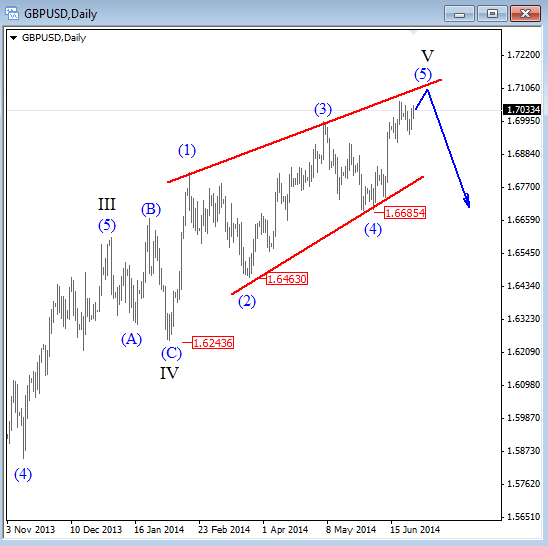 If I am on the right track with the count then shorts could in interesting in wave four, but of a higher degree as highlighted on the chart. Firstly need to wait on more price and data, to make sure I am on the right track with the counts. I wish you good trades in 2015! A Special Holiday Offer on Yearly Membership with 31% OFF!! We have Limited Time on this offer so if you are interested make sure to take advantage of discount. Offer expires on Jan 11 2015. 2014 has been a very interesting year for the market because there were not a lot of choppy and ugly price actions. Waves were very clean and directional, and more importantly, they moved into my desired direction. 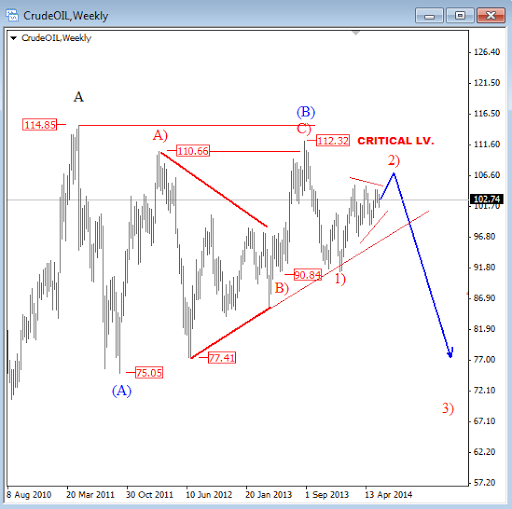 I was expecting a bullish turn for the USD in-line with bearish view on WTI Crude Oil and Gold, while I was still expecting higher prices on the stock market, particularly on S&P500 index. I picked some of my past analysis and compared them to today’s prices. As you will notice I was on the right track with the market swings and also my trades were mostly taken within the predicted direction. I am very happy with my yearly return; it's up nearly 15%. Now some will say just 15?! But keep in mind that on 80% of my trades I risk near 0.75% of my trading account! Also keep in mind that when it comes to trading more important than making money is to PROTECT IT! We wish you Merry Christmas and all the best in 2015!! 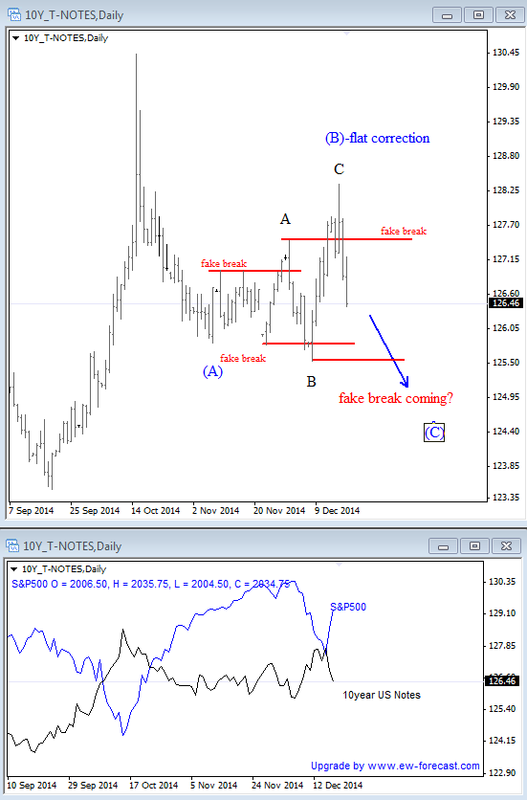 The reason why S&P could once again revisit all time highs is the following chart of 10 year US notes where we see "fake breakouts in play". Recent one was at the highs, so looks like new bearish leg is now in play for December low. At the same time stocks should then stay bullish. 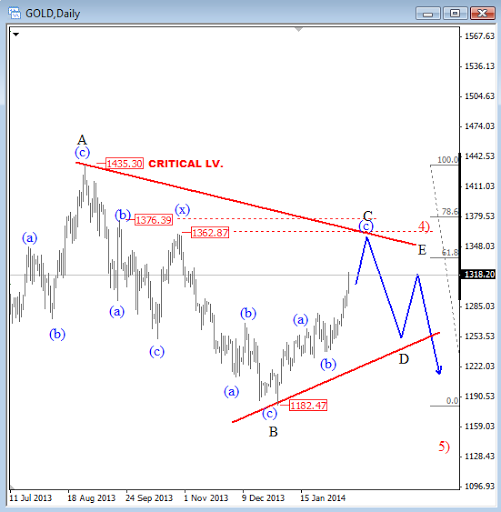 USDJPY has turned down last week and finally took out the trendline connected from around 105.00 which confirms the end of a five wave move within a black wave 3. 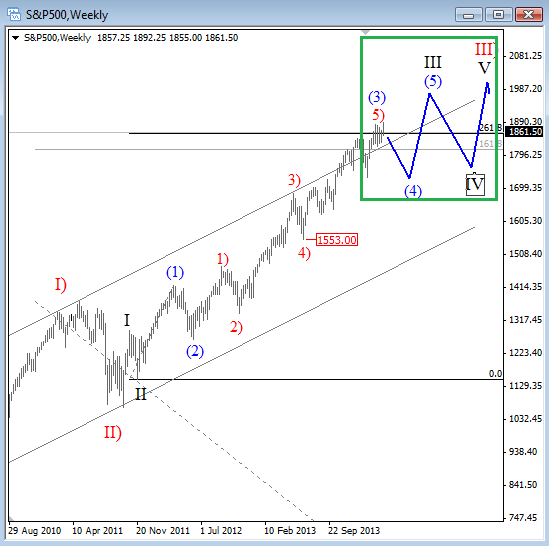 As such, we expect a larger corrective retracement now in wave 4, with three subwaves down, for 38.2% compared to wave 3. 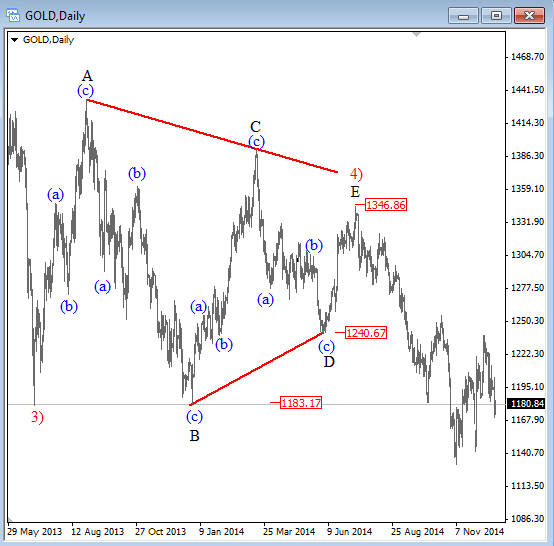 In our case that level comes in around 115.50 so ideally more weakness will occur this month while 121.85 is in place. Once these levels will be seen, we will keep an eye on a new continuation higher, while price at 110.10 is not breached. 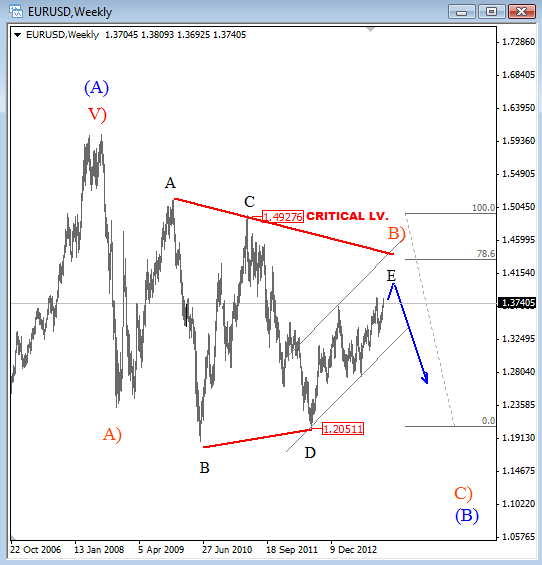 EURUSD is in strong downtrend since start of the summer, but this weakness could slow down soon if we consider that pair has five waves down from 1.4000, while USD index is trading close to the highs from 2009. 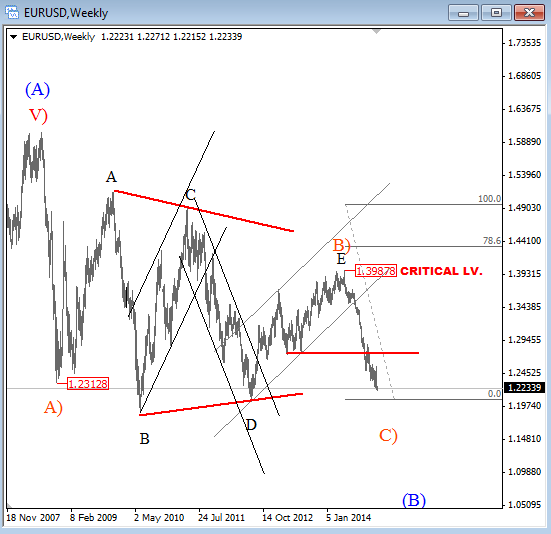 As such, we would not be surprised to see some recovery on EURUSD in weeks ahead. 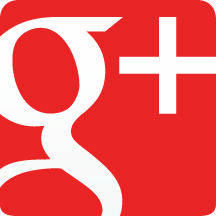 For full and detailed analysis check our video below. 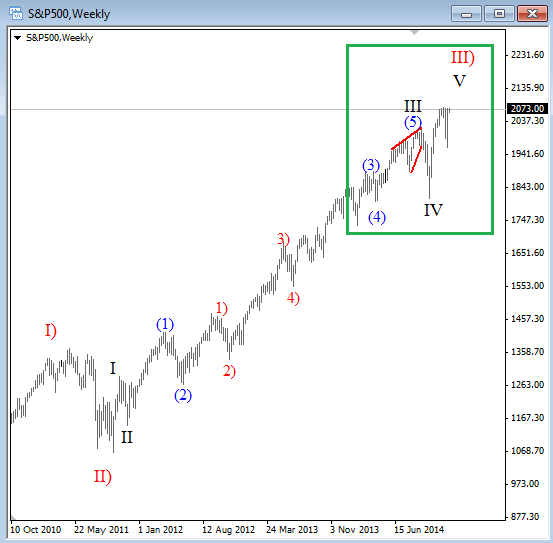 E-mini S&P500 made a minor five wave decline from the latest highs, while DAX could be topping in fifth wave. 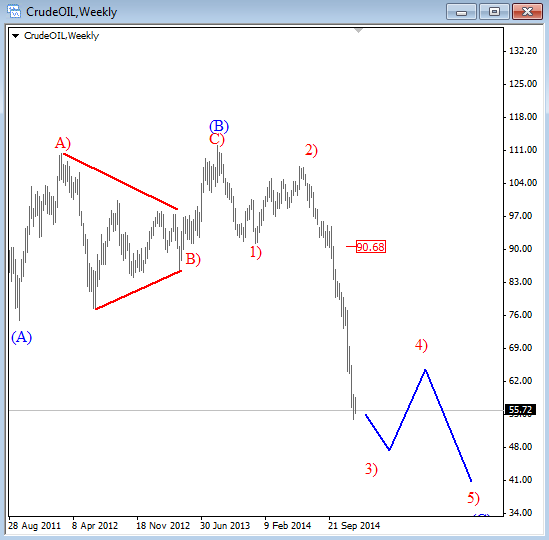 What does it mean for AUDJPY and other yen-crosses!? My view can be found in video below. Germax DAX - "Perfect Set-up!?" #3 Keep an eye on daily close price and daily candlestick reversal pattern. If you will find all three points on market that you are tracking, then it may be good to be aware of a continuation in the direction of a larger trend. 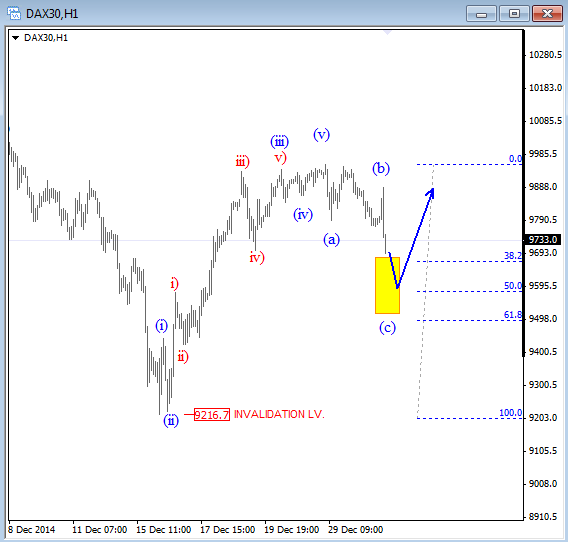 Like on German DAX as shown below.